Over the weekend we had the pleasure of revisiting Ann Arbor for the first time since moving south. The trip was highlighted by food, and of course family. A good combination. That pairing came out in all its glory on Thanksgiving itself with a wonderful feast prepared and coordinated by my Mom, with contributions from my Dad, Julia and her Mom, my Grandmother and my cousin Susie. And me! The buffet sparkled with a beautiful 18-pound brined and roasted turkey, a delicious feat my Mom has mastered over the years. 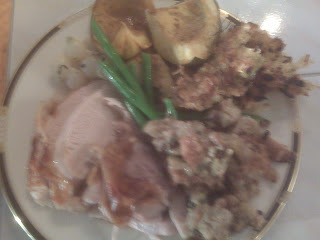 By its side was a menagerie of other delicious Thanksgiving classics: turkey dressing and gravy, green beans, creamed pearl onions, maple roasted acorn squash and sweet potato squash, my Grandmother’s drunken cranberries and vegetarian dressing, vegetarian gravy, bakery rolls and Susie’s mashed potatoes. Oh yes, and one very non-traditional dish – mine. Italian roasted fennel. And people actually liked it’s a lot taste as well as its relation to the rest of the traditional meal. Bingo! When my Mom asked me to bring something green to Thanksgiving, my mind raced through creative and not-so-creative variants of Brussels sprouts, collard greens, spinach, broccolini and even a salad as a cooler, lighter, fresher Thanksgiving diversion. But I finally settled on a green that is not so green but more white: fennel. Finally fennel. I grabbed the most enormous bulb of fennel I’ve ever seen – it looked like a head, especially with all the greens sprouting out of the top. I then grabbed a brick of Reggiano parmesan, olive oil, Panko bread crumbs, two small white onions, salt, pepper, mustard powder and ground sage. And of course, a large, disposable, aluminum roasting pan. Earlier in the day on Thanksgiving, while Julia and her Mom were concocting their delicious apple and lemon meringue pies to go with my Mom’s pumpkin pie later for dessert, I put together my fennel dish. I took the fennel bulb and cut off all of the green tops and set them aside before thinly slicing the entire fennel bulb and stalks. I also finely diced the two onions and put all of the onions and all of the fennel into the aluminum roasting pan. I added a pinch of salt and pepper to the mixture as well as about four tablespoons of the olive oil. I then grated with a micro planer about 8 ounces of parmesan. I might have even been more generous than 8 ounces. It doesn’t matter. I took about three quarters of the cheese and put it in with the fennel, onions and oil and to that added about three quarters of a cup of the panko bread crumbs. Now, with clean hands, I mixed the entire concoction together to be sure that the seasonings, crumbs, cheese, oil, fennel and onions all were mixed together and well incorporated. The mixture wasn’t quite getting as moist as I wanted, so I added a little more olive oil to be sure it would roast well. Finally, I evened it out in about a one-inch layer in the pan and created the topping. The topping was the rest of cheese and another quarter to half cup of bread crumbs mixed well and pressed on top of the entire layer. Over that I drizzled a little more olive oil and then sprinkled a little more salt and pepper as well as a pinch each of the mustard powder and sage to give it that earthy Thanksgiving feel. I finished it with a few of the fennel greens, roughly chopped. I could have cooked it then, but I covered it and put it in the fridge to be cooked later. Julia actually finished off the dish that afternoon by roasting it in the oven at 350 degrees for about an hour before putting it under the broiler for another minute or so to get it a little extra crispy. Of course, at this point you need to keep an eye on it, because it could very well burn and I wouldn’t want that. The final result was golden and crispy and had thinned down to less than half an inch thick. In the mean time though, the flavors had concentrated and mixed together and the fennel – normally an intimidating and strongly-flavored ingredient – was tender and flavorful and salty and earthy and teeming with succulent decadence. I was very impressed with the turnout of the dish and will definitely be making this one for future holiday meals. The crowd, after their initial fennel intimidation, actually loved it and the different kind of aspect it brought to our otherwise spectacular meal. I can’t say my dish made the meal, but it was a yummy twist that certainly made the meal a little more distinctive than most. And I suppose that’s all I can hope for amongst all those yummy-cookin’ (and bakin’) ladies!